Today, one of my closest friends encouraged me to post the below photos of the Floridian that I shared with her, regardless of words to put everything into context. I do believe these photos succinctly represent all that Chip has accomplished up to this point. Thank you Alison. The Floridian - in it's current state of construction. The back of the Floridian. I love that beautiful covered deck. 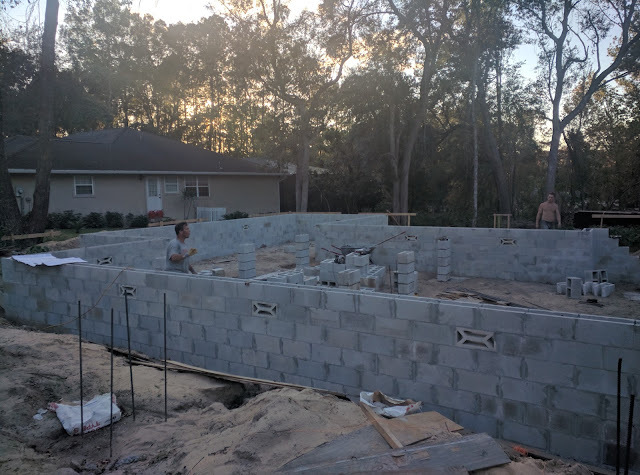 Acquiring our house plans was a process, we thought we were finished in Dec 2016 but it took another 5 months. It was worth the delays for during this time we saved money, bought a 5th wheel and prepped the site. 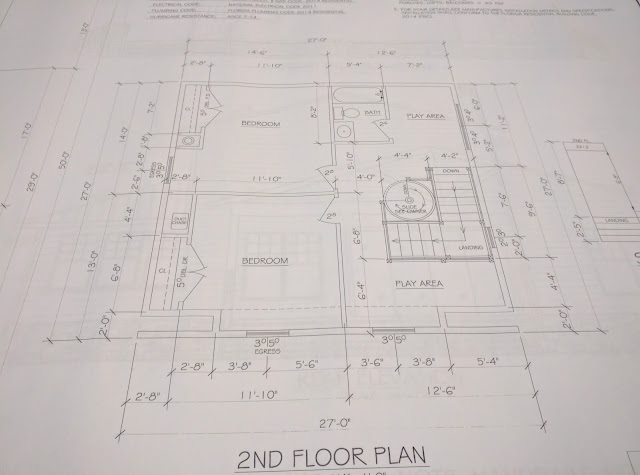 Initially, Chip wanted to draw the house plans but that idea was quickly mitigated by his knowledge of AutoCAD-type programs being outdated and not having the computer software. 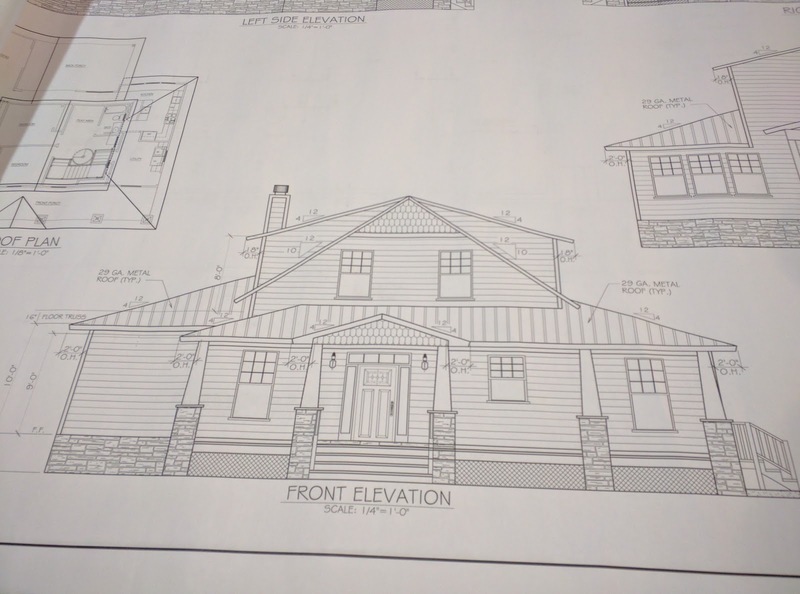 Therefore, we started our search with stock house plans but found 99.9% didn't match our preferences, see the must-haves listed in my Brainstorming about our Dream Home post. Then we happened upon an architect out West that had a house plan that really fit the bill, with some modifications. We were getting excited and contacted the company. During our scheduled phone conference, a hour passed by with fruitful discussion and ended in hopes that we'd hear back quickly with the final cost for the plans, with our requested changes. Prior to modifications, the house plans would cost a minimum $6,000. Certainly, we were concerned about the high sticker price but knew this would be one instance to pay up, ensuring we got our dream home. One week went by, then another and still nothing. In week three, as I was delaying my follow-up call for the inevitable, wince-inducing costs to be revealed, Chip had buddy recommend a local drafter. Chip got the contact info and immediately set up a meeting. We showed him our ideas and examples of what we were looking for and he discussed his pricing, which was a third of the architect out West. We hired him, never looking back at the other company (and they never did contact us). We met with our drafter a half dozen times, sent numerous emails and scheduled a few phone conferences, while navigating how to communicate what we wanted structurally and aesthetically. I'm grateful that we didn't work with the other architect as we got almost everything we wanted working with our local guy. 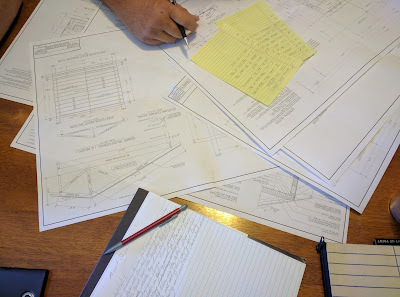 Meeting with our drafter for one of the last times to finalize the plans. So let me take you through a tour of our house: When you arrive at The Floridian, you'll walk up the wide steps to the 40' x 8' covered porch landing and enter the house's foyer. Turning to the right you'll see a closet and half bath, then off to the left of the foyer, our study/library. 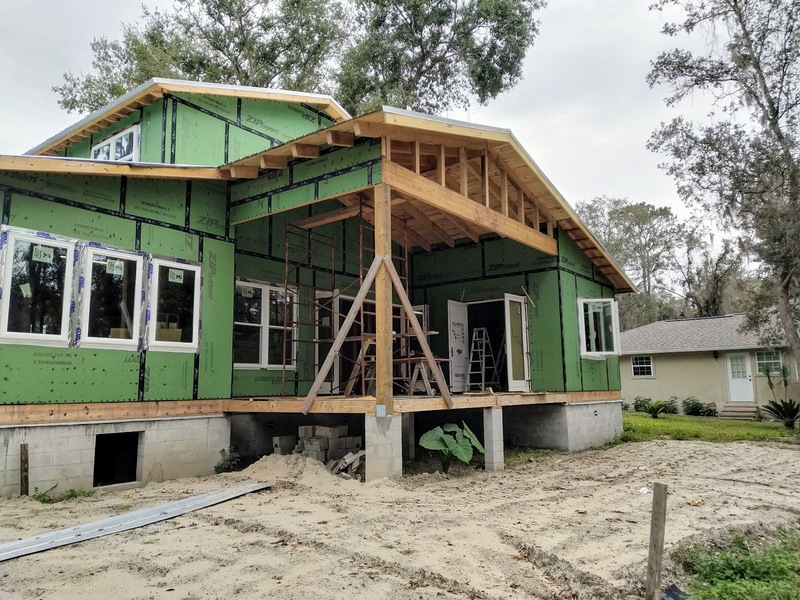 As you walk down the short hallway you'll see the living room with 4 glass paneled doors leading to the covered back deck and as you turn to the left the living room seamlessly transitions to the dining room and kitchen. At the same time you might be distracted by a strange, large object in the middle of the stairwell, which may puzzle you at first, but as you come fully into the living room you'll realize it's a slide. The slide is visible from anywhere in the living, dining and kitchen spaces. In the kitchen, you'll notice a 10' wide windowed sitting space that looks welcoming so you take a seat, have a glass of wine and enjoy the company while watching the kids of all ages use the slide. You've had your wine so it's time for the tour to continue - next we'll walk through the pantry to the utility room, which will have a half bath (sink and fancy slop shower only) for the purpose of cleaning up messy stuff (i.e. Chip with greasy hands/arms to dirty dogs and more). Then perhaps you'll step outside with Chip for him to show off his garage, or like me, you'll want to see the master bed, bath and closet and so we'll venture across the house to the master bedroom, which has sliding or french doors leading out to the covered back deck and a bathroom and closet that can be accessed both from the bedroom and from each other (i.e. walk into bathroom from bedroom, then enter closet from the bathroom to get dressed there to then enter bedroom again). Having finished the tour downstairs we'll venture to the second floor. This concludes the written tour but continue reading for more about the second floor. The second floor has some wasted space - the Play Areas, which we had trouble avoiding. Originally, the stairwell was up against the front right corner of the second floor which I really liked as there was a window shelf and only one play/sitting area. However, in March 2017, when we submitted our house plans for review to the building department, they had a laundry list of items to be fixed or clarified and the biggest issue was the fireplace not having a chimney (I can just hear Homer Simpson's "d'oh!" every time I remember that glaring mishap). Adding a chimney forced the entire second floor to shift to the right. In the end, I wasn't disappointment with the upstairs changes as it won't be used as much as the downstairs area. 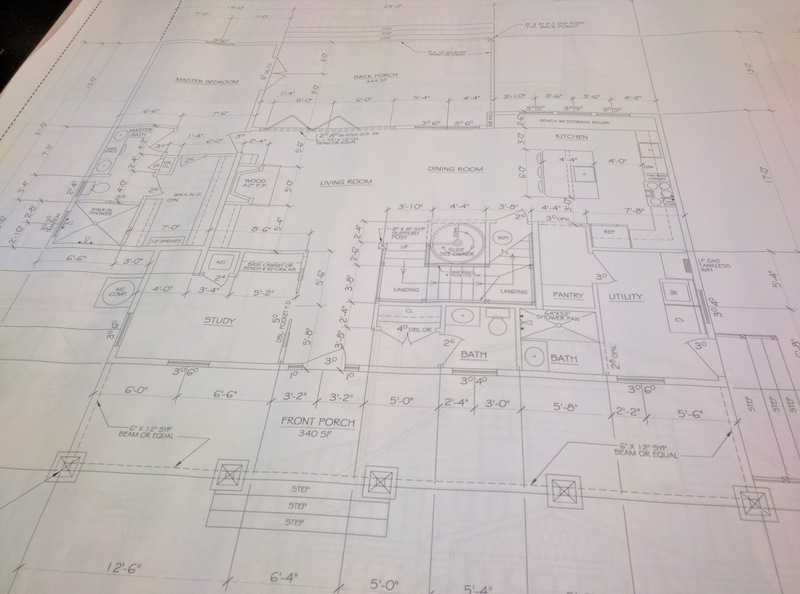 The house plans were fun to work on but challenging too. 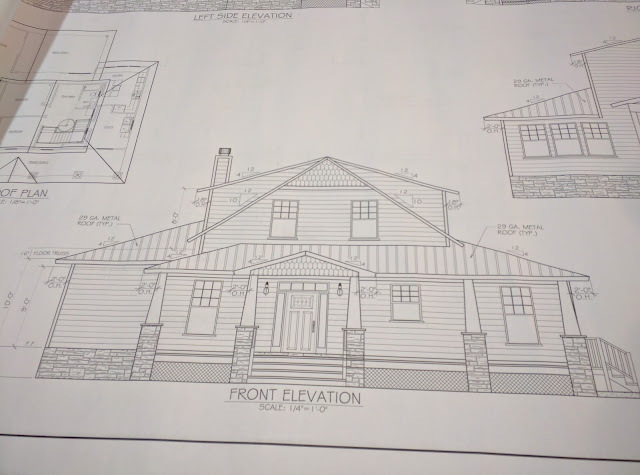 We submitted our house plans for a second time in July 2017 and were approved a week later! 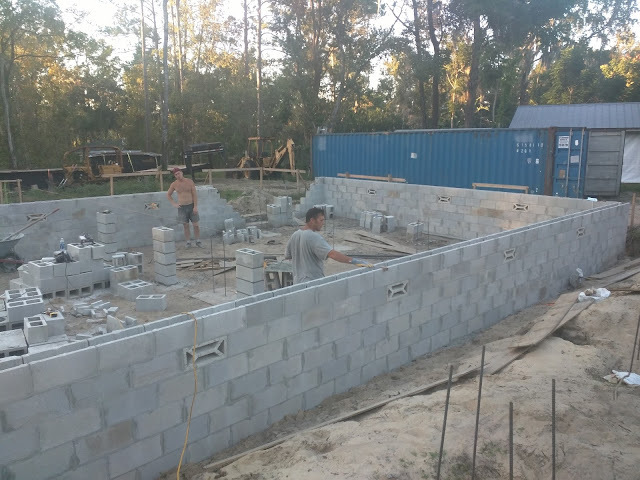 This past September, prior to Hurricane Irma, we broke ground on The Floridian. Whoohoo!! 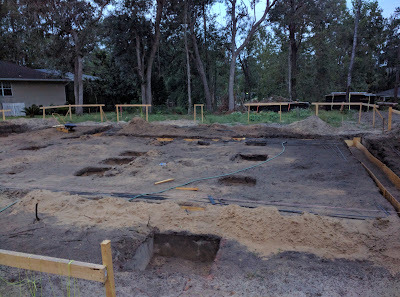 First inspection stage was to dig the footers - this is the square spaces in the ground and perimeter of the house that get dug for concrete to be poured. 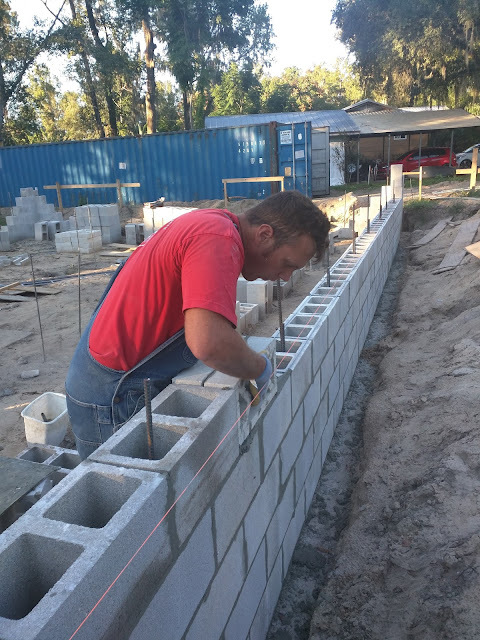 The Floridian is a stem wall foundation which means the house sits on pillars - like houses built in the olden days, with a crawl space. The thought of having our house suspended above the ground without a slab seemed scary at first but I've gotten used to the idea and realized that it's a common way to build houses and some of those olden-days houses are still standing today. Anyway, Chip wanted a stem wall for two reasons, one, so that he could easily access the plumbing and other items with ease. Secondly, a stem wall is needed for the look of the house (the design layout will be in my next post, so check back soon!). 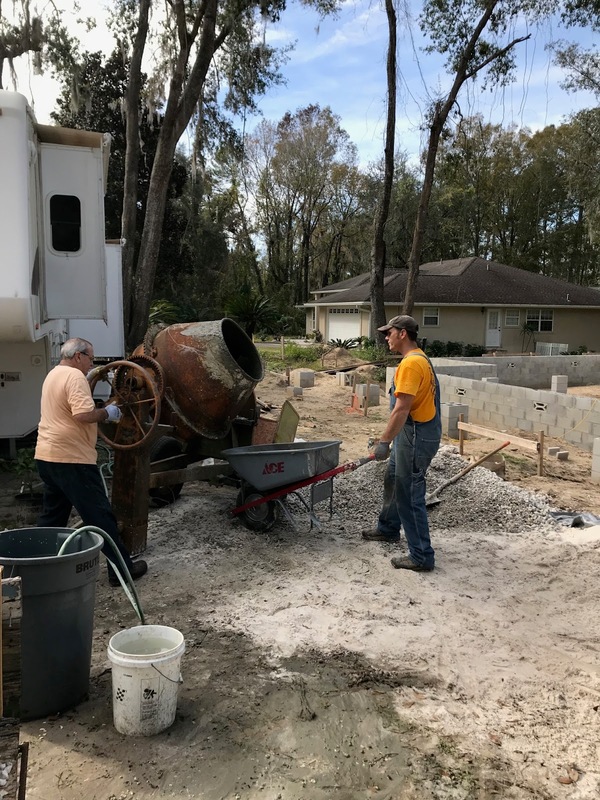 With impending Irma, things stopped for a several days then we were back at it; well, really Chip was back at it. Building a house together and renovating are two completely different things, at least in my opinion and at this stage. Chip asks me to "dig over there and make it level" and I go "what that heck does that mean?! There's miles and miles of dirt and it's hot and I want to start preparing lunch and dinner and I need to give the dog a bath and I want to work on the birthday card for so and so...." If you know me, then you get the idea. We both concur that I'm a complete and total sour-puss when it comes to manual labor of this sort. However, if given clear, concise instructions, with a end goal that I can see, then I'm golden (and as long as I have a book on tape ready to go). One day, Chip instructed me dig the 10 square spaces until they were 22" wide and level with the laser level (the best $350 ever spent!). I was on point that day, or so I thought - but apparently I move too slow (so Chip says) and on top of that, scattered bouts of rain forced us inside several times. Me on my good day, standing in one of the square holes and hold the laser level stick. Notice the umbrella, in the middle back, protecting our coveted laser level beam. I am proud to say I was not a sour-puss that day and that contributed to the most manual labor I put into the first stage of building The Floridian. Meanwhile, Chip was a work horse day in and day out - turning each t-shirt into a wet rag with sweat, laying it out to dry then wearing it again until a wet rag for round two (I say gross! Chip says I don't want to dirty up another shirt. We do have a washer and dryer! Oh my goodness!). Alright, enough talk about that. The footers were no easy task - we had quite a few trial and error situations. In the photo above notice all the bowed wood - Chip put up wood on both sides of the perimeter only to have the wood bow after it got wet. In addition, we spent several times renting a tamper - I even rented it once and loaded it up in my sedan. The staff gawked about putting it inside my car as it was smelly because of the gasoline but it fit and the sun was out and the windows rolled down worked like a charm. Anyway, the first two times the item was rented we weren't even ready to use it by the time it need to be returned and the last time Chip didn't realize the dirt turned to powdery, avalanche-inducing dirt when the tamper started jumping so we spent a night watering the foundation and then tamping the following day and resolved to pay for a fourth rental fee. The rental company was generous enough to not charge us for that one. 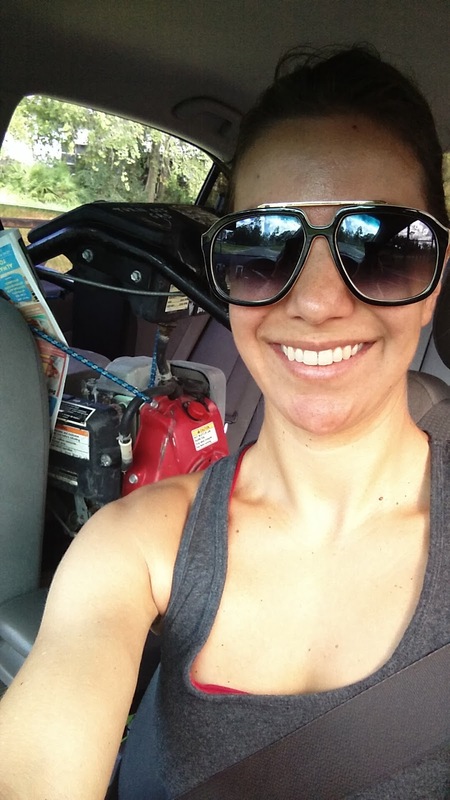 Transporting the tamper (behind me on the left side) in my sedan. 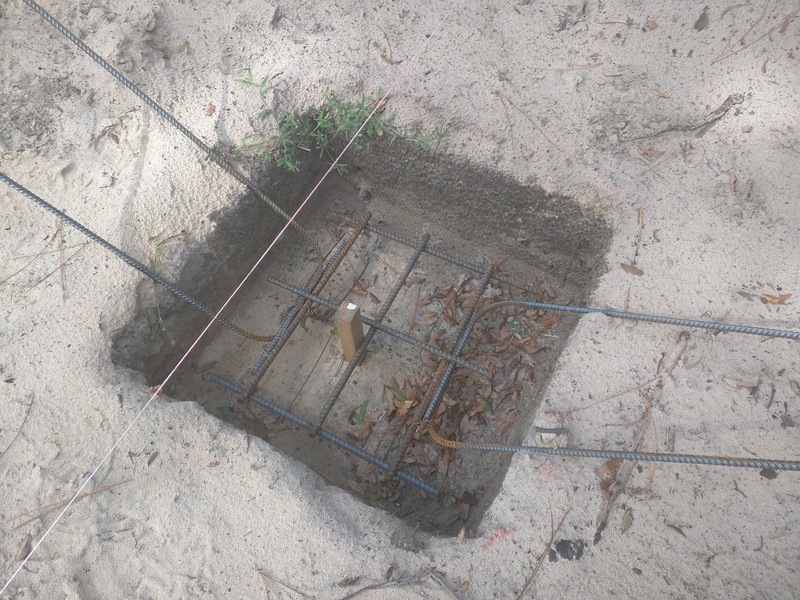 Once Chip was satisfied with the digging, then he set the rebar (reinforced steel bars) in place. 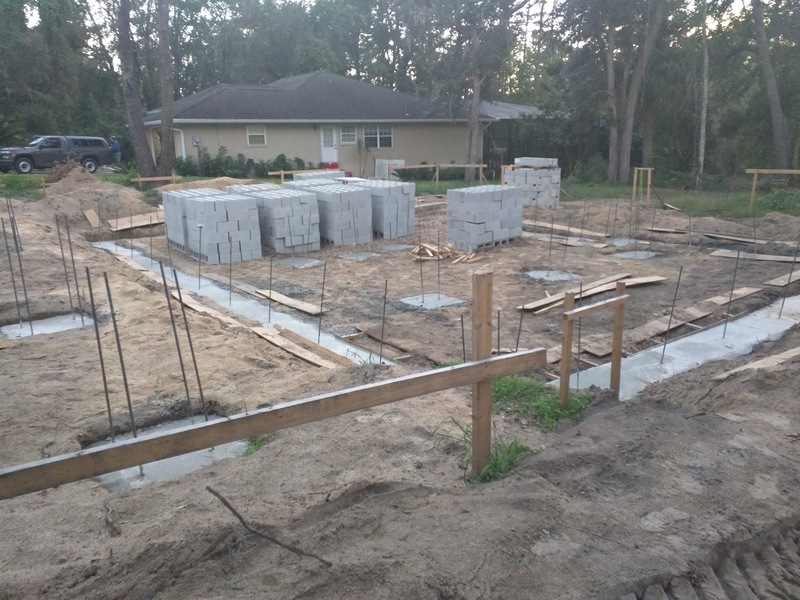 The foundation with rebar set in place. 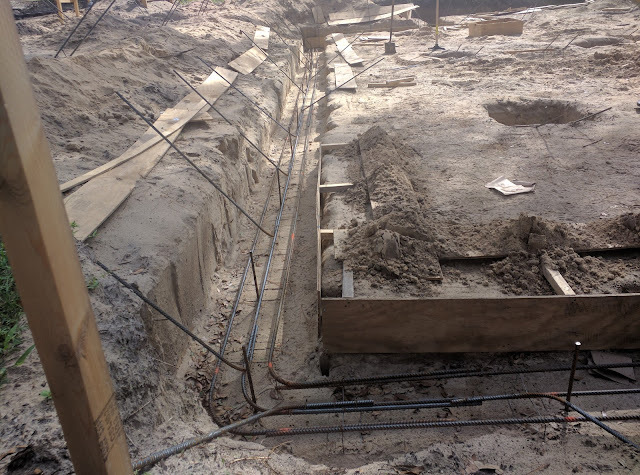 The rebar laying on the outside will be standing upright when the concrete is poured and sets. A close up look at the rebar in the perimeter. Then we were ready for our first inspection and Chip passed! I'm so proud of him. Our inspector gave him a nice compliment, stating the job looked professional. The next stage was quickly set in motion - concrete would be poured in 3 days time and cinder blocks and mortar would be delivered the following day! P.S. After reviewing my post with Chip, he reminded me that I missed a big initial step: Excavating! 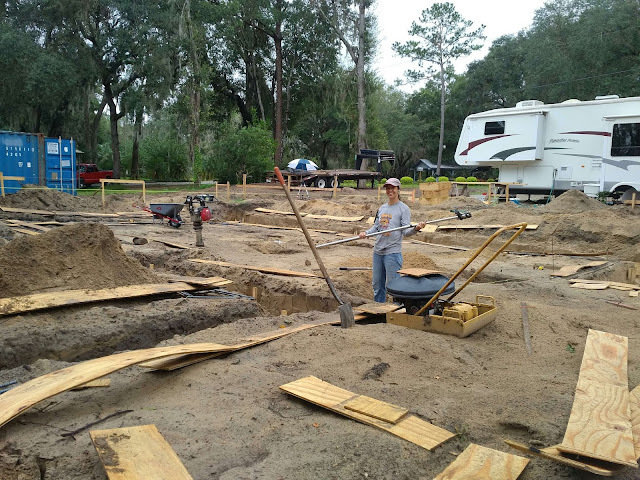 Chip and his father spent a day excavated the site with the bull dozer. 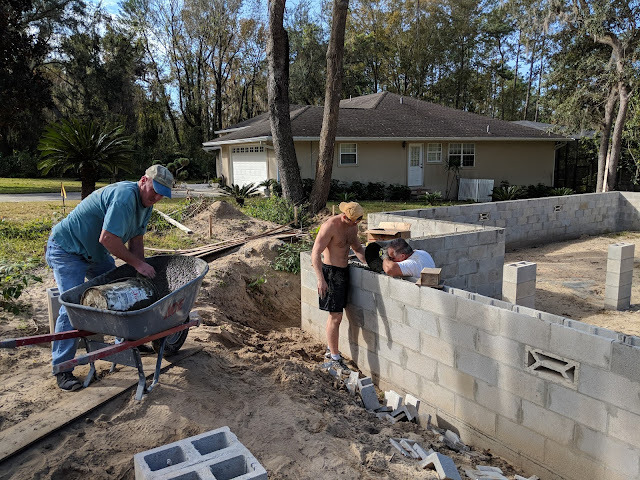 As The Floridian sit on a slope, areas of excavation in the front are about 3 feet deep with it tapering off to no additional excavation at the back of the house. P.P.S Gosh, I'm missing more stuff! I didn't talk about layout - the truly first step. This means setting up what's called batter boards and stakes (i.e. 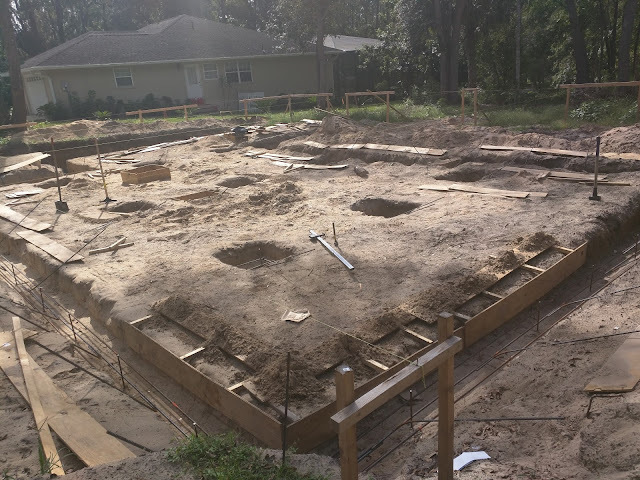 2x4's around the site) and stringing lines to determine where the excavation needs to occur and where the foundation and pillars will be. It must be noted, I did help here and contributed bobby pins to measure where our intersecting strings will be. A surprising, small thing occurred during this process - the dragonflies loved it! Early in 2017, I heard of a home building convention being held in town. With much excitement I dragged Chip along and with the vendors map in hand we notice the list of entirely hired-out services and companies to the likes of seamless gutters, water filtration and flooring. The reality of the situation was apparent, our efforts to glean knowledge would be futile. The positives of attending the convention was we verbally acknowledged that we are our own staff and needed more, specifically the hot items in current building materials. Through Google searches, we came across The Southeastern Builder Conference, watched some promotional videos on Youtube, learned that the conference was being held in Orlando, FL and in 5 months time. We grinned from ear to ear at one another, we had found what we were looking for. Two months prior to the conference, I debate about booking a room at the conference's host, The Gaylord Palms. There's a promotional deal for $150 a night, which could be minimized to 2 nights, and we're attending the conference for seventy dollars each. I think to myself, what a steal and to stay at one of the fanciest hotels in all of Orlando, I'm in! Chip reasons that we could stay a lot cheaper with the RV and we can bring Bandit. Being price sensitive, I'm easily swayed and book at the nearest RV resort. 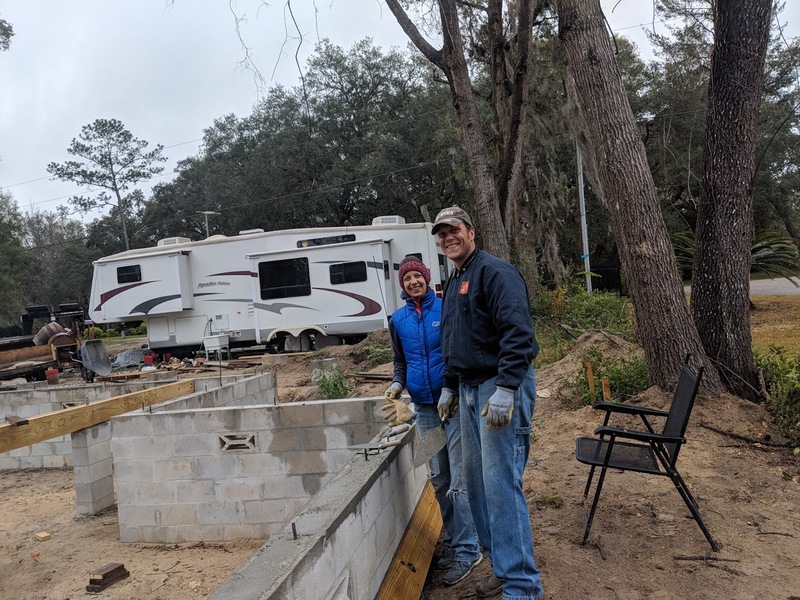 For the following weeks we both unknowingly start to look forward to the conference, it seems less like homework and more like a 4-day, 3-night getaway (which we could really use after all the delays and time needed to get the RV fixed). It's July 25th and departure is less than 24 hours away - let the debacle begin. The truck's AC goes out, it was out a week prior but Chip thought it was fixed, however, this time it really goes. The good news, Chip knew the problem and was able to fix it, costing us $200, and delays our departure by 5 hours. I'm exasperated, I should be in a resort pool by now, but okay, it is what it is. I remind Chip that he wanted to look at the brakes on the RV and he's throws caution to the wind and we haul out of Gainesville. On the interstate, we're smooth sailing - it's 5pm and by the time we arrive around 7pm we'll have a late dinner. All is good, and we are actually, occasionally, moving to the middle lane to pass other vehicles. Then, a semi truck pulls along side us and rolls down his window (on the interstate? we're confused. ), so I roll down mine and he says: "You've got a blown tire." Shocked, we didn't feel anything happen, we pull to the shoulder. Sure enough we not only have a blown tire but it is entirely gone! The wheel remains with flapping tire bits around it like Medusa's hair. The RV is swaying from side to side by the force of oncoming vehicles zooming past us. Throwing caution to the wind is no flippant idea any longer; safety is our first priority. There's an exit about 3 mile away, with relief that we're not going to have to work on the side of the interstate, we take our time to the exit. Pulling into a vacant lot we focus on the task at hand pulling out tools and removing the wheel, while staying optimistic. "Oh honey, let me document this for my blog." and "Is that why you wanted me to a buy a lug wrench?" come spewing out of my mouth, I'm resolved that the issue will be promptly fixed and am therefore curious and eager to help. That is, until Chip states the spare is dry rotted. My face falls but Chip, the problem solver, tells me to start searching for a tire place, he thinks there's a Tractor Supply not far. I locate a tire place directly behind the parking lot, but closing in 30 minutes. Jackpot! Chip tells the owner we need 2 new tires, one for the ride and one for the spare. 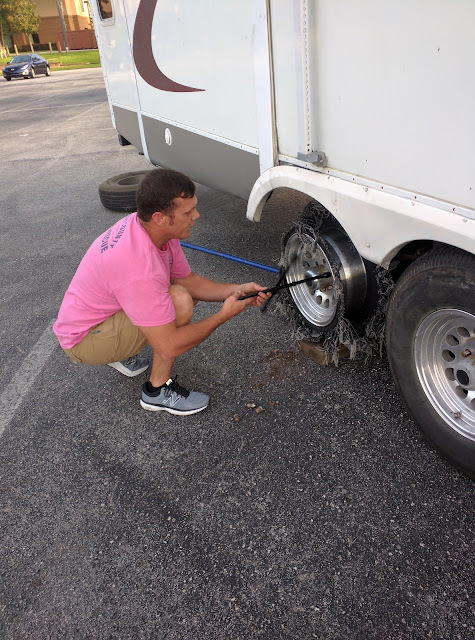 Tire guy starts jacking up the RV and reports that we'd better add another to the list because the one riding just front of the blown town is dry rotted too. An hour later, $500 spent, and back on the road we're crossing our fingers we arrive no later than 11pm. Arrival to the Grand Palms RV & Resort - we're tired, completely and utterly over with the day but glad to have finally arrived. We hope our arrival signifies a new start, with no more issues, and gratefully head to bed. The morning brings back our vigor and we attend day 1 of the conference happy and read to learn. We divide and conquer going to different breakout sessions before the expo opens. Chip learns about new plumbing options and attic insulation concepts. 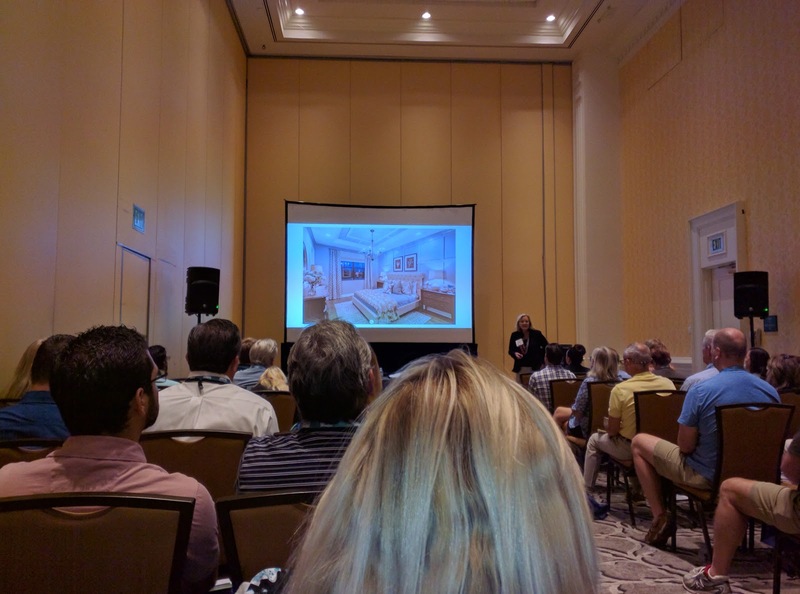 I attend sessions on money/tax saving tips and best ways to avoid leaks. The expo opens and we navigate vendors, skipping past those that don't pertain to us (contracting computer software and, again, flooring options) to the materials and new products that Chip wants to hear more about but I take note that I need to focus on the opportunities to complete all the giveaways and drawings (especially because majority of the attendees were men and in my opinion, many men don't focus on the details, such as apply for a Yeti Cooler giveaway - the most popular item vendors were offering as a prize). 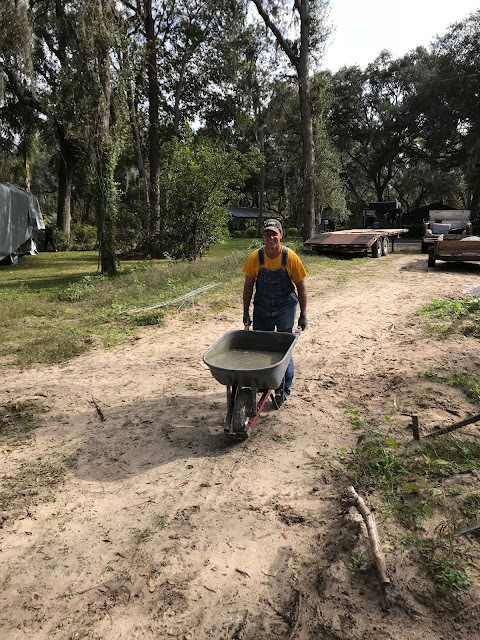 I steer Chip to the tables with giveaways and he then steers me back to the materials, the gentle tug back and forth is fun and by the end, with only a few more rows to visit tomorrow, our dogs are barking but we feel empowered (I know I'm winning one of those coolers!) and renewed. That evening we made plans to meet up with my mother in Kissimmee to eat at The Catfish Place. The dinner out and catching up with my mom is enjoyable and a nice break from the fiasco of the day prior, then head back to the RV to find that the AC isn't running, actually nothing is turning on. Out come tools, Chip yammering away about how buying the RV was a dumb idea, and discovers that the converter broke but have no idea if the AC is broken and won't be able to tell until we get a new converter. (I have no idea what a converter is but safe to say that we needed it, however, now it's 8pm and the store that supplies it, Camping World, revolves around the retired population (because dinner is no later than 5pm for the early bird special), and is in fact closed. We are grateful that it's night time and the temperature in the RV with the windows open is bearable. More problem solving ensues as we want to attend the next day's breakout sessions but we can't leave the RV without AC all day in the dead of summer in Florida because Bandit would die (RV's heat up like cars and the circulations of air through the windows is meager so we feared the worst). The outcome - we'll attend the first session, then head to the resort to pick up Bandit, then to Camping World, then replace the converter and hope that's the only issue, then head back to the conference (missing some breakout sessions) but visiting the last vendors at the expo. In the end, it was the converter, thank God!, but by the time we are back at the conference it was apparent that we were in no mood to be there, feeling defeated by the fiasco's of the last few days and just wanting to have ourselves a little getaway, which was anything but. The next game plan - blow this popsicle stand and finally enjoy our late afternoon and evening - a stop to the store that makes shopping a pleasure and in the cart goes frozen pizza, drinks and snacks then we'll hang by the resort's pool. All will be okay. Then it's rains and rains the entire evening. The Southeastern builders conference was worth our time but we'd had enough - things could be worse but we cut our loses - there'd be no getaway for us. It was time to go home. P.S. The conference was poorly documented because of all of the above. P.S.S. I did win a Yeti Cooler! Chip said that at least something good came of the conference. On the other hand, I was elated that I actually won something. 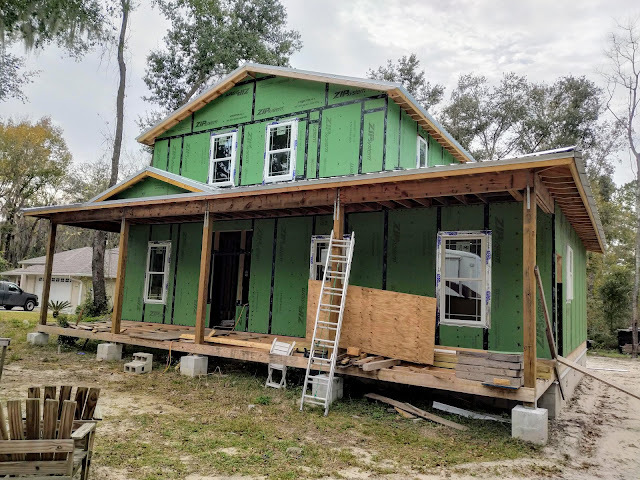 I visited my blog yesterday and it brought me so much joy reading about our adventures in building The Floridian. So, why haven’t I written since March? That’s so long ago in the Internet age. Truth be told, several months ago my computer broke and it was all my fault. I carelessly knocked a glass of water into the side of my 2009 Mac. It took everything in my being to quell my anger and sadness; I purchased the Mac with my first paycheck from my first professional job after college and had taken good care of it for 6 years. Alas, Chip was extremely instrumental, and thoughtful, in taking the time to dry it out, then cleaning the internal components and watching lots of YouTube videos before it was, to my utter surprise, fixed. It comes to life (oh, trusty Mac), albeit a wounded warrior with a limp so it hasn’t been the same since. Hence, I’ve been avoiding my computer and the effects have trickled to my blog. Reading my last few blog posts gives me renewed energy and so, with my limping computer, I start back up again. There are many things to discuss but let’s start with the exciting news: We’re moving out to our property! 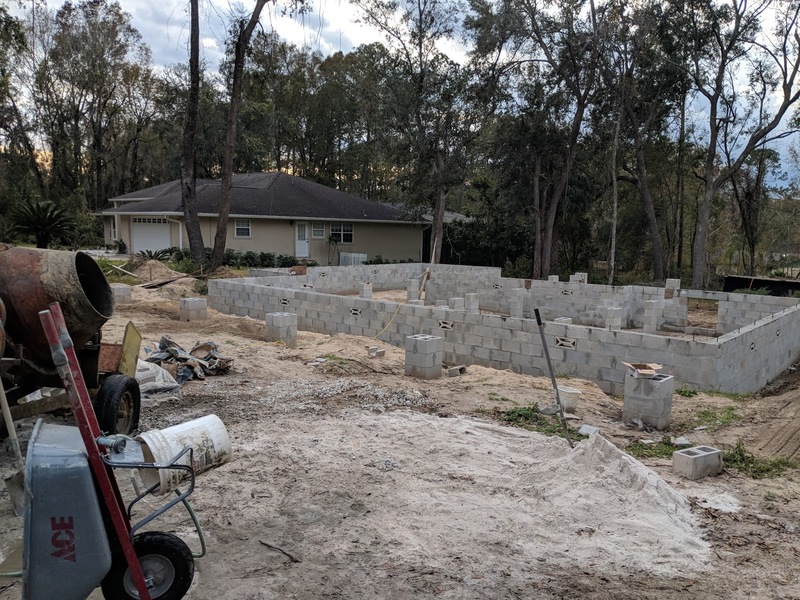 I’m super excited about living on our land but it, unfortunately, won’t be in the studio above a garage as there will be no garage, at least for the time being. There’s no garage because when we finally turned in our building permit paperwork the building official told us we couldn’t have two dwellings on the property (the house and the studio), so Chip and our drafter reworked the studio into a “man cave” by removing components from the kitchen to make it aligning the likes of a wet bar. Recognizing that Chip and the building official were perhaps not on the same page in understanding one another, he followed up with the official to confirm the conversation they previously had, way back in September, that we could move into the studio (now the man cave) before we start construction on the house and Chip got a resounding no. We were baffled. 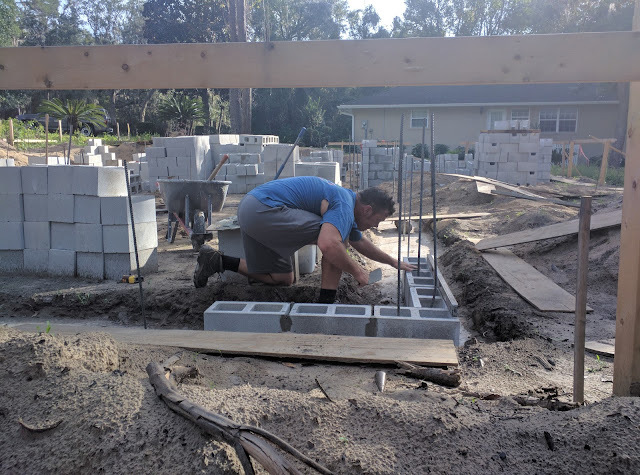 Why would we go through the trouble of building a garage with a studio and not move into it when we informed him we were owner-builders and building out-of-pocket and we previously asked him? Regardless of the email documentation we had, we knew the official would give us a hard time and it wasn't worth it. Then, one day, Chip says, what do you think about buying a RV? I know we already decided against it but perhaps we need to reconsider it as an option. Sure, let’s do it, I say. 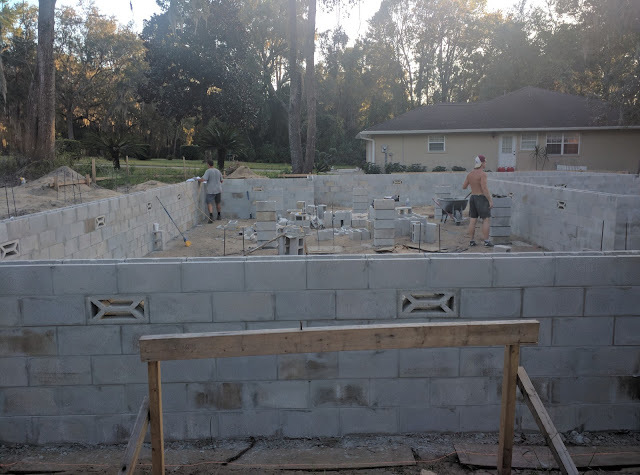 We had hoped to be building by January and it was already April with no plans of building in the near future, so yeah, let’s make something happen. The RV shopping commences and, one, I feel like a baller (because who shops for RVs? The rich! bwahaha) and, two, memories flood back of being eight years old again and thinking, oooohhh, I want to have a tea party with my tiny house and small kitchen drawers and an easy bake oven. Our price point puts a prompt end to my baller-vibe as we shop for RVs in the 10k price range, then increase it to 15k, still no-baller, until the price point sneaks up and we find a beauty at a dealership that will cost us $23,500 out the door. We realize things are getting out of hand and walk away from the deal to focus our energy on private sellers for increased negotiation opportunities and better prices. A couple weeks later we settle on a 2005 36’ fifth wheel for 17k. Buyers remorse is strong for Chip, that money could have gone to building the house, and the reality that I have to cook in a teensy tiny kitchen is deflating. We remind ourselves daily for the next week that we have to keep our eyes on the prize. 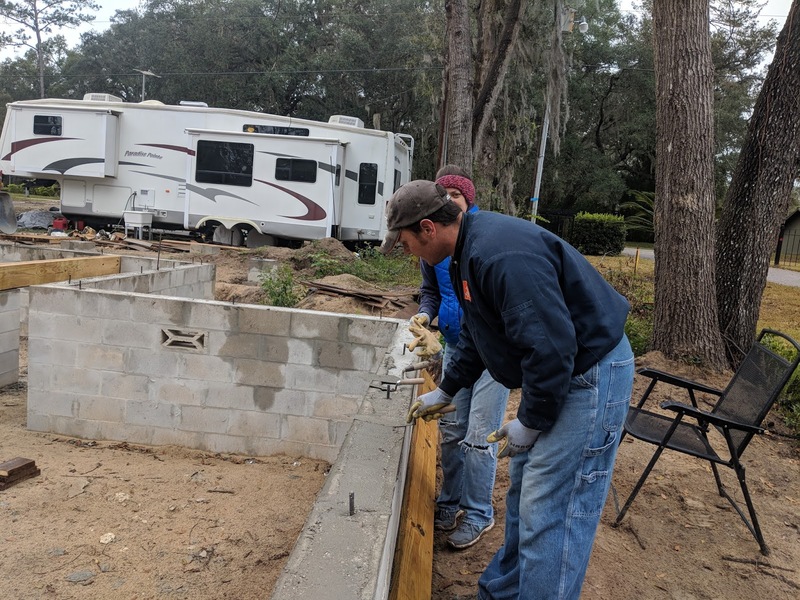 We’ve had the RV for about two months now and we’re a lot wiser to the shimmy sham RV world (in case we ever plan to buy another one again, which we don’t). What’s the shimmy sham? 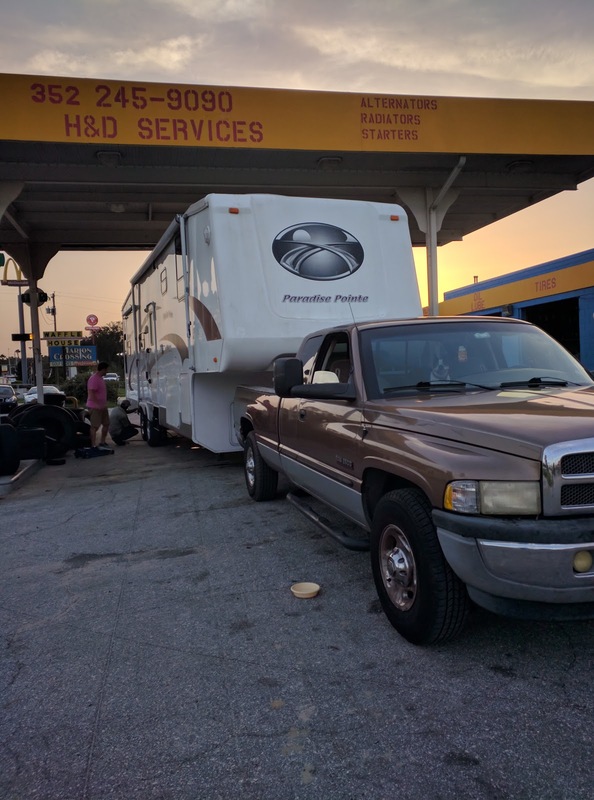 It’s that RVs are poorly constructed thereby needing constant care so they don’t fall apart. The main culprits - bad construction and water. The RV we bought had no water damage as the previous owners used it four times a year for weekend trips and had it covered when not in use. We took it for a preliminary trial run one night and it happened to rain like cats and dogs. Well, low and behold the roof was leaking and water was running down the interior side of the RV and then onto the floor. RV’s in our opinion are complete junk. We watched a few videos on how they’re made and it takes 6 hours to build a RV and our RV retails new for $56,000! That’s ludicrous. What’s more, eleven years later, the original owners sell it to us for $17,000 and they hardly used it. We’re going the get our money's worth on our RV because it’ll be our home for the next two years.